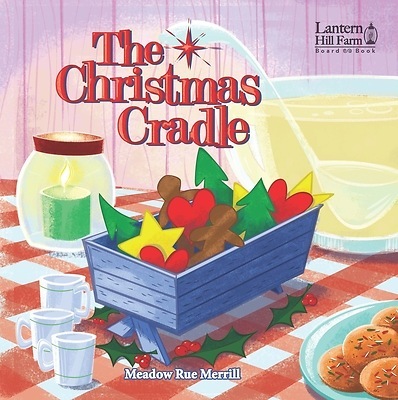 The Christmas Cradle board and picture books by Meadow Rue Merrill are engaging illustrated books for children one to four years old and four to seven years old, respectively. Every Christmas Eve, Aunt Jenny and Uncle Gerry hold a huge Christmas party at their home, Lantern Hill Farm. Molly gets to help get ready for the party. Disaster strikes when the furnace breaks, and the party has to move from the farmhouse to the barn. With help from cousins Jacob and Sammy and neighbor Rosa, the children clean up the barn and decorate cookies, while discovering the story of the Christmas cradle. This is a family tradition in which Aunt Jenny encourages the children to give gifts to Jesus by welcoming him in, sharing the good news with others, and spreading his love through service to others.